Bishop of Elphin to speak on ‘Faith & Family: A Heritage to be Proud of’. 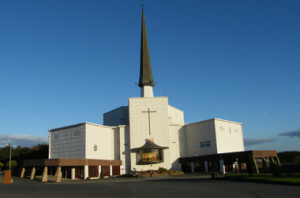 The theme of this year’s National Novena in honour of Our Lady of Knock is ‘Faith and Heritage’. The novena will take place from 14 to 22 August and the list of speakers lined up include the future Primate of All Ireland, Archbishop Eamon Martin, as well as Bishop Christopher Jones of Elphin and Bishop Philip Boyce of Raphoe. The first speaker to address pilgrims will be Fr Tommy Murphy, SSC, the former superior general of the Columban order. The title of his address is, ‘Living the Heritage of Faith Today’. A day later, the Archdiocese of Tuam’s diocesan youth director, Trish O’Brien, will address the congregation on faith and young people today. Over Saturday and Sunday 17-18 August, Bishop Philip Boyce of Raphoe will discuss ‘Faith in Difficult Times’ while Bishop Christopher Jones will speak on, ‘Faith & Family: A Heritage to be Proud of’. Other speakers from 19 to 22 August include Professor Salvador Ryan of Maynooth, Fr Richard Gibbons, parish priest of Knock, Fr Frank Fahey of Ballintubber Abbey and Carmelite Fr Gerry Fitzpatrick. Separately, Bishop John Buckley of Cork & Ross is to celebrate Mass for the Feast of the Assumption at the Lee Road Shrine on Thursday, 15 August at 7.30pm while Augustinian Fr Tom Sexton will give the sermon. Members of the public intending to participate in this popular ceremony are to assemble near Our Lady’s Hospital Gate before 6.30pm, from where they will walk in procession to the shrine reciting the fourteen Mysteries of the Rosary on the way. When all pilgrims have arrived at the shrine, the fifteenth Mystery will be recited by the entire congregation before Mass begins.